We have experienced roofing contractors with an impeccable track record of making sure the job is done right...the first time. Call (508) 269-8469 for a free consultation. Did you know that 90% of all roof problems are installer error. Most problems are at roof penetrations, like chimneys and vent pipes, or intersecting slopes, like valleys and crickets, or at the end of the slopes where the roof lines end and the gutters begin. Understanding and preventing these possible problems is what separates experienced, qualified roofers from the rest of the pack. The key to having a sound roof is to start with a manufacturer that is willing to stand behind the installation and provide a labor warranty. Manufacturers don’t do this without thoroughly checking out the roofing company. They make sure the contractor has the qualifications and experience to follow strict installation guidelines. A homeowner can be misled as to what is covered and for how long. Unless you read the fine print it could be too late. Your Home Exterior Solutions eliminates these risks for you. Need a quality roofing contractor? Choosing the right roofing contractor is very important. It may also be one of the most difficult experiences for a home owner. Inspection of the current condition of the roof surface for visible signs of fatigue or failure. Inspection of the existing ventilation and water carrying system. Inspection of the attic to determine condition of wood sheathing, ventilation and insulation or air sealing. Inspection of the chimney and all areas that may require repair or replacement of the flashing or re-pointing. Determining whether a replacement roof or roof repair is needed or if there are other conditions that may be causing problems. Not every roof that leaks is a bad roof. Ice dams could be causing the problem as even new roofs have been known to leak. Providing a variety of roof options for style, color, and the length of the warranty period that fits your budget. We have decades of experience successfully dealing with a wide variety of unique roofing challenges. This is why we are so sure we can successfully and cost effectively, address your roofing needs. See what some of our many customers have said about our work. Call (508) 269-8469 for a free consultation from an experienced professional. Proudly providing home improvement services in Mansfield, Foxboro, Franklin, North Attleboro, Attleboro, Easton, Sharon, Norton, Needham, Wrentham, Norfolk, Foxboro, Plainville MA and surrounding communities. Your Home Exterior Solutions' Services include New Windows, Replacement Windows, Roofing, Exterior Siding, Composite Deck Designs, Custom Entry Door Replacement, Air Sealing, and more. "We were looking to replace all of the windows in our home. 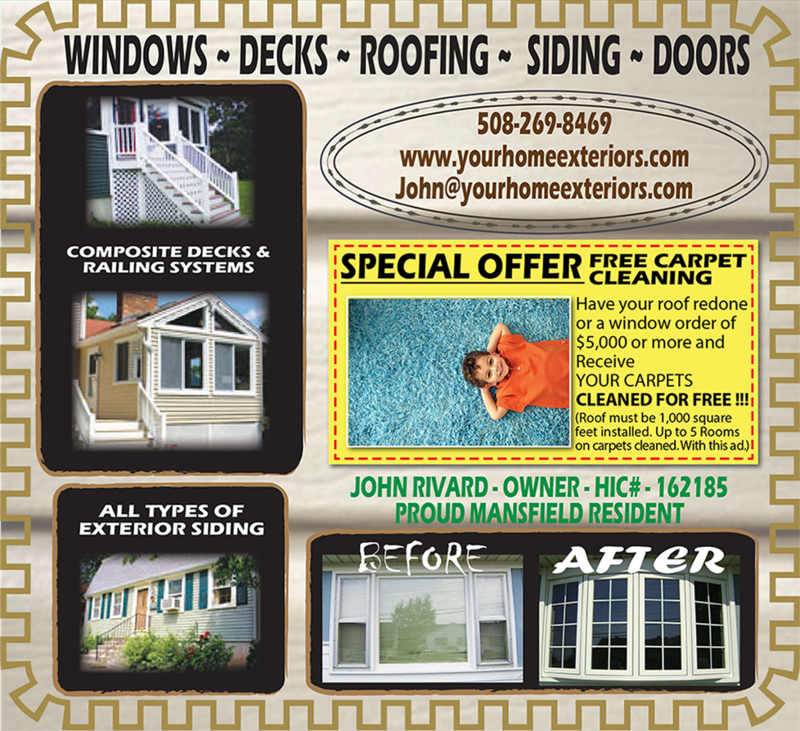 John and his company (Your Home Exterior Solutions) were recommended to us by a neighbor. We were impressed with John’s professionalism and knowledge of the products. He was a pleasure to work with throughout the process and his installer (Roger) clearly knew his business. In addition to the new windows, which are fantastic, we used the company to replace and/or repair some trim boards and gutters. Again the work was top notch. In 2010, we hired Your Home Exterior Solutions to replace our deck railings. Once again we are very pleased with both the product and the workmanship." fill out our online form to send us an email! Copyright © 2019 Your Home Exterior Solutions - Mansfield MA 02048. All rights reserved.